Most homeowners want a small chainsaw. It’s that simple. Yes, I know there are many of you out there who need a heavy-duty chainsaw. We’ve written many comprehensive chainsaw review articles for you, but this particular article is for people who need a small chainsaw. Nothing large, or heavy or powerful. A small chainsaw that can be handled by anybody — young, old, weak, men and women. This article is for you. A small chainsaw is an invaluable tool to have around the yard. Not only are they practical for pruning, trimming, cutting firewood and felling small trees but they are also useful for clearing trees in your yard after a storm. Beyond the typical applications, a small chainsaw is a helpful tool when mother nature unexpectedly comes to your neighborhood, like when you find yourself in a disaster situation like an earthquake, tornado or hurricane. This article covers 12 of the best small chainsaws that money can buy. I hope you find this guide informative. What do I mean by small chainsaw? Which Small Chainsaw is for You? Before we get into the details of each small chainsaw I want to clarify a few things. First, all of the chainsaws in this article are very good to excellent. There are no bad small chainsaws on this list. In fact, if you’re a regular reader of Chainsaw Journal you’ll already know that I like to spend my time writing about good quality products and rarely do I include poorly made products in these articles. If I do, I make sure I warn you about its shortcomings. Since all of these small chainsaws are worth spending your hard-earned money on, the deciding factors are going to come down to your budget, your needs, and the often overlooked factor of your overall health, strength and familiarity with chainsaws. Budget is fairly straightforward. How much money do you want to spend on a small chainsaw? How much money can you comfortably afford to spend? The majority of these chainsaws are under $150. A few are around the $200 range, and several are under $100. There’s a chainsaw here for every budget. What will you need to accomplish with this chainsaw? Most of these small chainsaws are for light-duty cutting, with a couple exceptions. But generally, with a small bar and chain you’re going to be limited in terms of the overall diameter of wood you can cut. If you need a chainsaw for heavy-duty cutting then consider something like the Husqvarna 455 Rancher, or read Best Chainsaw for the Money. Chainsaws are demanding power tools to use and you need to seriously consider the weight of the chainsaw and your overall strength. It may seem light at first but after 10 minutes of cutting you may feel fatigue and find it more difficult to work. Fatigue is a factor in causing injuries so it’s important that you take regular breaks when working. Safety first. Read our chainsaw safety guide for some tips. How comfortable are you with chainsaws? These are dangerous tools and I don’t blame you if you’re afraid to use one. To be honest, I’d be concerned if you weren’t afraid. It’s important that you wear the proper safety gear when using a chainsaw, such as: Husqvarna Pro Forest, chainsaw chaps, and anti-vibration gloves. Thankfully, there are two excellent alternatives to chainsaws that I’ve included on this list: WORX JawSaw and the Black & Decker Alligator Lopper. Both are great options for people who don’t want to use a chainsaw for safety concerns. You should be aware that although chainsaw chaps is essential safety gear when operating a chainsaw they are far less effective when coming into contact with an electric chainsaw. Why? Because electric chainsaws have continuous high torque, and gas chainsaws are low torque. Essentially what this means is that when the chain of an electric chainsaw gets caught up in the fibers of your chainsaw chaps, it will continue to increase it’s torque, but a gas chainsaw will drop its torque, allowing the fibers to stop the chain from turning. Although electric chainsaws are not as powerful as gas saws you need to realize that they are perhaps more dangerous in some regards such as this. If anyone has more information about chaps and electric chainsaws please contact us directly and provide us with the latest information on this important issue. As far as finding the right small chainsaw, I promise you that there’s something here for everyone. I’m confident that you’ll find a small chainsaw to fulfill your needs. If this is your first time buying a chainsaw then I recommend reading our Chainsaw Buying Guide before making your purchase. It’s important that you buy the appropriate extension cord if you decide to buy an electric chainsaw. Thankfully, we have a Extension Cord Buying Guide for you understand how to choose the right extension cord. I will recommend suitable extensions cords for each chainsaw, so don’t worry, I’ll make this as easy as possible for you. That’s our goal at Chainsaw Journal — We do the research so you don’t have to. Again, everything about the UC3551A is the same as the UC3530A, except it’s better. Oh, and it’s also much cheaper. It’s a win-win for consumers. Includes: Makita chainsaw, Saw Chain, Guide Bar, Chain Cover (scabbard). Rubberized grip handles are ergonomically designed for comfort. The Makita UC3551A is one of my favorite small chainsaw on this list. In many ways I think it’s the perfect homeowner chainsaw. This chainsaw is solid, sturdy and built to last. It has a 14″ bar and chain, powered by a very powerful 15 Amp motor; and it feels comfortable in your hands with its rubberized grip handles. It also comes in a 16″ version just in case you want something with a little more cutting capacity: Makita 4051A. Makita makes consistently fantastic products and the UC3551A is no exception. This is a professional quality chainsaw that you’ll feel as soon as you hold it in your hands. It has heft. The motor is made by Makita and they’ve truly maximized the amount of power generated by their 15 Amp motor. Honestly, you’ll be surprised at how quickly this small chainsaw cuts through wood. Differences: Makita UC3530A vs UC3551A. We’ve already done a comprehensive review of Makita UC3530A so I’d rather not repeat myself here. I recommend reading the full review on the Makita UC3551A. If you can afford the price don’t hesitate to buy this exceptional electric chainsaw. It strikes a nice balance between weight, power and price. If you only use a chainsaw once or twice a year then I understand that you might not want to spend the money, but if you want a small chainsaw and you plan on using it on a regular basis then you should seriously consider Makita UC3551A. It’s also rather quiet thanks to its well-designed motor. It starts smoothly making it less jarring when you start it. It won’t jerk in your hands like most chainsaws. This small chainsaw can easily replace a small gas chainsaw. Yes, it’s that good. It’s ideally suited for cutting wood under 12″ in diameter but capable of larger wood when you need to. This isn’t a heavy-duty chainsaw so don’t expect it to fell large trees on a regular basis but for an electric chainsaw, it truly is surprising at how well it cuts. Although, I shouldn’t be surprised since Makita makes consistently quality tools. It’s easy to use for anyone and starts every time. When it comes to buying a small chainsaw you need to consider the question: How long do you expect your chainsaw to last? If you want a small chainsaw that will last you for many years to come then I recommend spending a little more money for a quality chainsaw. A cheaper chainsaw won’t be as durable, such as the Remington RM1415A Limb N’ Trim, which I’ll cover next. Makita is one of the best manufacturers of chainsaws. Generally speaking, the more money you spend the higher the quality of parts contained within your chainsaw. More money means more metal and less plastic. When it comes to chainsaws you get what you pay for so don’t expect Makita or Husqvarna quality in a $100 chainsaw. Be realistic about your needs and what your expectations are for the chainsaw you buy. Far too many homeowner buy an underpowered chainsaw, push it beyond its limits, then go online and complain about how terrible that chainsaw is. Unfortunately, in many cases, the owner either doesn’t know how to use a chainsaw properly or bought the wrong chainsaw for his or her needs. Please, don’t throw your money away on the wrong chainsaw. Be realistic. Designed to be comfortable to hold and use for extended periods of time. You’ll need a quality extension cord to get the the maximum power from this small chainsaw. Learn more about extension cords by reading: Buying the Right Extension Cord. It’s easy to adjust the chain and there’s no need to remove the sprocket cover. All you do is turn the knob to adjust the chain or replace the guide bar or chain. It’s a simple mechanism that anybody can use. View or download the MANUAL for the Makita UC3551A chainsaw. View or download the PRODUCT INFO for the Makita UC3551A chainsaw. View or download the MANUAL for the Makita UC3530A chainsaw. View or download the FLYER for the Makita UC3530A chainsaw. Every Makita tool is thoroughly inspected and tested before leaving the factory. If you are not satisfied with any Makita tool within 30 days of purchase, return it and Makita will provide, at Makita’s option, a replacement or refund. If you want a cheaper chainsaw than the Remington Limb N’ Trim I suggest you buy a chopping axe. You won’t find a cheaper small chainsaw than this. And if you do, let me know. 14-inch low-kickback bar and chain. Compact, lightweight design is easy to use. Push-button oiler lets you add the right amount of oil. External chain tension adjuster makes tensioning easy. View or download the MANUAL for the Remington Limb N’ Trim. The Remington RM1415A Limb N’ Trim is at the opposite end of the scale when it comes to small chainsaws. Not only is it small but it’s cheap — under $50. If you want to spend as little money as possible and still get a decent chainsaw then this is probably the small chainsaw for you. It has a 14″ bar and chain and an 8 Amp motor. It has a manual push-button oiler instead of an automatic oiler of more expensive chainsaws. In life you typically get what you pay for and for the price you get a decent cheap small chainsaw that can handle small jobs around the yard. I recommend using this chainsaw for pruning, trimming and brush cutting. You can also fell small trees. Because this is only an 8 Amp motor I would suggest you use this saw to cut wood under 8-inches. You can cut larger wood, even 12″ but you’ll have to be patient, because it will take a little time. This chainsaw is for small cutting jobs. It’s a cheap chainsaw so don’t push it. When buying a chainsaw you have to determine how big the wood you’ll be cutting on a regular basis because the last thing you want to do is buy an underpowered chainsaw in relation to your requirements. Why? Well, your cutting will be very slow and it’s also more dangerous to attempt to cut wood larger than the chainsaw can properly handle. The Remington RM1415A Limb N’ Trim is for small jobs around the house. Don’t expect it to do much more and you’ll be happy with your purchase. It’s extremely lightweight at 6.25 lbs so you’ll have no problem cutting all day if you need to. The many faces of the Limb n’ Trim saw. A nice little chainsaw for small jobs. You won’t find a cheaper chainsaw, just don’t expect it to last for ten years. Well, maybe, if you only use it once a year. Now we move on to the battery-powered small chainsaws — and there’s a lot of them. It’s natural that battery chainsaws would be small due to the limited power of modern day batteries. Battery technology is improving but not at the pace that you would expect. We can send rovers to mars and probes deep into outer space but we’ve yet to figure out how to make powerful batteries. One day soon I’m sure there will be a significant breakthrough. Currently, the most powerful battery chainsaw you can buy is the GreenWorks 80V, which I’m a big fan of, but it’s not in the ‘small chainsaw’ category. If you can afford it, and want a bigger chainsaw (18-Inches), you need to check it out. Before I get into each specific small chainsaw I want to say one thing because I don’t want to keep repeating myself. If you want to get a lot of work done with a battery chainsaw then you must be at least one extra battery, maybe even two, depending on how long you want to work. And yes, batteries are expensive. If all you plan on doing are small jobs around the yard then a single battery should be fine. Just know that the advantages of a battery chainsaw are it’s quiet, low maintenance, lightweight, no cord to manage, and no fumes. The main disadvantages of a battery chainsaw is that they’re more expensive due to the cost of the lithium-ion batteries. Also, their power is generally limited, unless you’re willing to spend a lot of money and buy the GreenWorks 80V. Having said that, battery chainsaws are perfect for homeowners who need the occasional use of a chainsaw and don’t want to be bogged down with complicated maintenance or constantly fumble around with an extension cord. 40V MAX* Lithium-ion battery can hold a charge up to 18 months. 12″ Oregon low-kickback bar & chain. Quality components for smooth quick cuts. 40V MAX* (2.0Ah) Battery. Makes over 60 cuts per charge. Automatic oiling system will keep your bar and chain well lubricated. Tool-less chain tensioner makes it easy to adjust. Complete wraparound handle. Comfortable to cut at varying angles. Battery is compatible with the 40V MAX* outdoor system. The Black & Decker LCS1240 is a very capable 40V battery chainsaw. This is a powerful saw made with high-quality components, including a genuine Oregon bar and chain. It has an automatic oiling system, which is always a sign of a good chainsaw. The translucent oil window makes it easy to see when it’s time to top up. Is this Small Chainsaw light enough for you? This tool is light enough for the majority of homeowners. It weights only 8.3 lbs. I consider that lightweight, but perhaps some older people may find that heavy after using it for 15 minutes. It’s important to know what you can handle because fatigue increases the chance of injury. If you want the lightest chainsaw possible then consider the Black & Decker LCS1020 (7.2 lbs) or the ultra-light Scotts SYNC 10″ small chainsaw (4.5 lbs). The 40V MAX Lithium Ion Battery is always ready and holds a charge up to 18 months. This battery provides over 60 cuts (4×4 pine lumber) on average, for each charge. Black and Decker MAX batteries have no Memory Effect; a common side effect of older battery types. If you buy the 2 pack of 40V batteries you save a lot of money. Don’t buy more than you need but if you want to tackle large jobs around the yard with this chainsaw then stock up on batteries. You’ll need them. Great chainsaw for homeowners who don’t cut thick wood on a regular basis. Works well on brush, and small firewood. Overall, this small chainsaw is powerful enough to handle all of your trimming needs around the yard and the occasional larger trees that you need fell. The battery lasts up to 45 minutes, depending on usage. Yes, it can cut the occasional 12″ tree but it will be slow and burn through a lot of battery juice. My guess is that most homeowners don’t have to cut down a lot of trees on a regular basis. Typically, people need a chainsaw for trimming, pruning and firewood. This Small Black & Decker chainsaw is great for that. There’s also a 20V version (Black & Decker LCS1020) of the same chainsaw, which we cover later in this article. This small chainsaw is well-made and it shows when you pick it up and hold it. It has heft and strength built into it. A great middle of the road chainsaw that will last you a long time if you treat it well. Robust Makita-built motor. 1,650 FPM chain speed. Works with two (2) 18V Makita LXT Lithium-Ion batteries. Quiet at only 89 decibels. A gas chainsaw is around 112 decibels. 12″ guide bar. Ultra compact chainsaw. Weight: 10.1 lbs. with batteries (batteries not included). Extreme Protection Technology (XPT): Makita’s patented dust and water resistant technology. Ergonomic rubberized soft grip top handle. Designed to apply even cutting pressure. Fast Start: Load two 18V LXT batteries and you’re ready to go. Adjustable automatic chain lubrication with large oil reservoir. Large oil fill hole. Translucent oil window. LED battery level indicators show power remaining in each 18V LXT battery. Fast Charger (sold separately) communicates directly with the battery by actively controlling current, voltage and temperature. The Makita XCU02Z is a small chainsaw with a 12″ bar and chain. It’s relatively quiet at 89dB. Much quieter than a gas chainsaw. If you’ve never owned a battery chainsaw before, there many advantages. Namely, you don’t have to worry about things like: replacing the engine oil, spark plug, air filter or cleaning the muffler. These are things you’d need to do If you buy a gas chainsaw. The compromise for less maintenance is less power. But if you don’t need to cut large trees then I recommend buying a battery or electric chainsaw. They’re more suitable for the average homeowner. Although, I have to say that a gas chainsaw delivers superior power to an electric or battery chainsaw, but nowadays, with the introduction of the GreenWorks 80V chainsaw, the competitive landscape is changing. Other features of this small chainsaw is the always practical time-saving tool-less chain adjuster, which basically means you can adjust or remove the chain without having to use an external tool. Also, it has a front hand guard designed to activate the chain brake when engaged, and an electric brake. Makita has incorporated their XPT (Extreme Protection Technology) in the Makita XCU02Z. It has a protective seal inside the chainsaw that provides an additional layer of protection against water, and dust. It’s not waterproof, but water resistant. Please, don’t go swimming with this small chainsaw — just in case you were considering doing so. This is an excellent homeowner chainsaw but Makita designs all of their tools for professionals, like contractors. For example, the Remington Limb N’ Trim is a cheap consumer chainsaw and can’t compete with this Makita chainsaw, nor should it. They are the opposite end of the quality spectrum. The Makita XCU02Z has been designed to be used under harsh conditions where dust and water are present. Requires 2x 18V batteries working in parallel. If you decide that this is the right small chainsaw for your needs then just be aware that you need to purchase the battery and charger separately. I’ve laid out your options below for you. And although you can but the batteries separate you save money when buying the two pack. Remember, this Makita chainsaw uses two 18V LXT batteries. If you own other Makita tools compatible with these 18V LXT batteries then you can use your current batteries and save some money. Charges 2 batteries from 25 to 45 minutes, depending on battery type. View or download the MANUAL for Makita DC18RD Rapid Charger. Charges two (2) 18-volt lithium-ion 2.0 Ah batteries in 25 minutes. Charges two (2) 18-volt LXT lithium-ion 3.0 Ah batteries in 30 minutes. Charges two (2) 18-volt LXT lithium-ion 4.0 Ah batteries in 40 minutes. Charges two (2) 18-volt LXT lithium-ion 5.0 Ah batteries in 45 minutes. Built-in USB port. You can charge your portable electronic gadgets. Charger communicates with the battery’s internal chip as it charges. This optimizes battery life by controlling current, voltage and temperature. Built-in fan circulates air to cool the battery throughout the charging process, thus reducing charging time. This Makita charger has 3 Active systems to control current, voltage and temperature to protect your batteries from over-discharge or over-heating as it charges. Built-in processor inside battery communicates directly with charger to enable it to charge depending on its overall condition and charge level. Digital display tells you the overall charge level and condition of battery (-80%, +80%, 100%). Buy the two pack to save money. 35% more run time than the Makita 18V LXT Lithium-Ion 3.0 Ah battery (BL1830). Completely charged in under 40 minutes. Fully compatible with 18V LXT and 18V Compact cordless tools that carry the star symbol. In 2005 Makita released their 3.0 Ah 18V battery, which was a big deal for homeowners and professionals who work with cordless tools on a regular basis but times have changed. Makita now makes 4.0Ah and 5.0Ah batteries. Ah stands for Ampere-hour (or Amp-hour), which is a unit of electric charge, equal to the charge transferred by a steady current of one ampere flowing for one hour. The higher the number of Ah the longer you can run your tools before having to recharge. You don’t need to understand the technical details, just know that 5.0Ah Makita battery has more electrical energy stored inside than a 4.0Ah Makita battery which means you can work longer on a single charge. A good example is that Makita did a side-by-side internal test. They tested a 18V LXT Hammer Driver-Drill powered by their 4.0 Ah battery and drilled 25 holes. In comparison, the same tool drilled only 18 holes with the Makita 3.0 Ah battery (BL1830). Optimal battery power if you want to maximize your run-time. Built-in safety system for over-discharge, temperature and current protection. Optimum Charging System utilizes 3 Active Controls (Current, Voltage & Temperature) to maximize battery life. Internal battery memory chip communicates with Charger CPU to streamline the charging process, depending on the state of the battery. This model has been at the top of the charts for years. A true workhorse! View or download the MANUAL for the Black & Decker LCS1020. 10″ OREGON low-kickback bar and chain. Manual Oiling system for bar and chain lubrication. Tool-less chain adjuster makes it quick & easy to keep your chain tight. The Black & Decker LCS1020 is essentially the same model as the Black & Decker LCS1240, which was reviewed earlier in this article. There are a few differences though. The LCS1020 has a 10″ bar and chain and is powered by a 20V battery, making it less powerful than its bigger older brother. Also, it has a manual oiling system, which means you have to use the primer bulb to keep the chain well-lubricated. The same design with a few changes. Black & Decker has been in business since 1910 and they’re still making excellent tools that consumers love. You don’t stay in business for over 100 years without making great products. The quality of this small chainsaw is very good. It comes with and Oregon low kickback bar & chain which will guarantee you’ll be cutting at the most efficient speed and with minimal vibration. Because this is a well-designed small chainsaw you’ll find it easy to hold and work with without getting tired. It feels comfortable in your hands thanks to the wraparound handle. This truly is a small chainsaw as it only weighs 7.2lbs. If you want to reduce your downtime then you should consider this quick charging system which will get your battery up to full power in less than 40 minutes. I wish Black & Decker just included this fast charger as part of the original purchase. I know companies make a lot of money with accessories but in this day and age consumers expect a lot of value when they spend their money. If SCOTTS can include a fast innovative charger with their SYNC small chainsaw then I think Black & Decker can easily do the same. Charge 16V MAX and 20V MAX Lithium-Ion Batteries. Charger incorporates maintenance mode to optimize charging. Extends battery life. Charges battery to 30% capacity within 10 minutes using Flash Charge. Multi-voltage charging lets you charge 16V MAX* and 20V MAX* batteries. Recharges batteries in under 40 minutes. A good choice for many homeowners. Ideal for: Pruning, cutting fallen branches, yard cleanup, felling very small trees. Expect to cut wood under 6″ with this chainsaw. Includes: Chainsaw, 20V Lithium-Ion Battery, Charger, Bar & Chain Scabbard and Operator’s Manual. 20V Lithium-ion — 2.0Ah battery. Fade-free power. No memory effects. Convenient charging station. Charge on the chainsaw or separately. Easy-to-read on-chainsaw battery power fuel gauge. 10″ bar and chain is ideal for pruning limbs and cutting fallen branches. The SCOTTS SYNC S20510 is another excellent small chainsaw on our list. this is ultra-lightweight at only 6.5 lbs, and with its 10″ bar and chain, the only thing you have to worry about is running out of battery power. You won’t feel fatigue with this chainsaw due to it’s compact size and below average weight. I love the unique charging station that this chainsaw comes with. 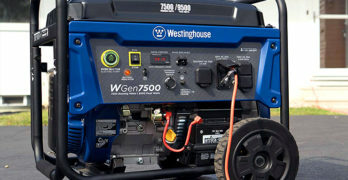 The charger allows you to either charge the battery when it’s connected to your chainsaw or separately, like a traditional battery charger. Also, it mounts on the wall and works as a place to conveniently hang your SCOTTS chainsaw when you’re not using it. And the best part, it fully charges the battery in under 45 minutes. I wish more companies included a quick battery charger with their tools. They often make you buy the quick charger separately but thankfully, SCOTTS knows how to provide value with their new line of SYNC tools. The nice thing about the charging setup is you can easily have it charging between uses to ensure that it’s always at full capacity when you need to do some cutting. You don’t have to worry about it over-charging as it will stop charging as soon as the battery is fully powered up. A nice design feature that homeowners will love. The battery doesn’t hold a lot juice as it’s only rated at 2.0 Ah. Don’t expect it to last long. I strongly suggest you get a 2nd battery with this chainsaw, unless you only plan to cut for very short periods of time. The 10″ bar and chain makes this small Chainsaw ideal for pruning limbs or cutting fallen branches. It’s covered by a 3-year warranty, which is a good sign, because SCOTTS is not really known for their power tools but they stand behind their products. This is surprisingly, a very good small chainsaw for homeowners that I wholeheartedly recommend. A backup battery might be a good idea since it’s only rated at 2.0 Ah. Overall, this is a small chainsaw that is very affordable and efficient at light-duty cutting around the yard. It’s easy to use for anyone and because it’s so light and compact, it won’t cause fatigue or put a strain on your back. I love the flexible charging system of this chainsaw and the fact that it charges the battery in under 45 minutes. For such an inexpensive chainsaw this is a nice feature to have. The SCOTTS SYNC S20510 is a great little chainsaw to have around the home for those small jobs. This unique chainsaw is backed by a 4 year warranty. Includes: G-MAX 40V Chainsaw, 12″ Bar and Chain, Scabbard, G-MAX 40V 2Ah Lithium-ion Battery, Rapid Charger, Owner’s Manual. Rear lock-off switch prevents it from accidentally starting. 12″ Oregon bar & chain. Tool-less chain adjuster. Fast and easy chain adjustments. Saves you time. Automatic oiling system keeps the chain well lubricated. Battery charges in under 2 hours. Battery lasts around 40 minutes, depending on usage. Clear, easy to view, oil level window. Wraparound handle makes it easy to cut from various angles. Reduced kickback chain. Safer to use. Lots of contours and rounded edges. The GreenWorks 20262 40V G-Max is a dependable small chainsaw with a 12″ bar and chain for your light-duty trimming and cutting projects around the yard. This is a unique small chainsaw, especially because of it’s tall shape. This isn’t a traditional shaped chainsaw but the benefit is that it’s easier to handle as it shortens the gap between the rear handle and the bar. Some people may not like this design. It really depends on your preferences and what you’re accustomed to when using a chainsaw. If you need a light chainsaw, this is a great choice weighing only 6 pounds. This isn’t the best small chainsaw on my list. It’s a good competent chainsaw but for the money you’d spend on this saw, you can get a better chainsaw. Either way, I like to give readers options and some people may prefer the unique design of the GreenWorks 20262 over a more traditional chainsaw. If you want a better 40V small chainsaw I’d recommend the 14″ Black & Decker LCS1240. It costs a little more money but has proven itself to be more reliable and durable over time. All things being equal, when it comes to spending your money, it’s usually best to buy something that has a solid history and made by a reputable company. Having said that, GreenWorks, although a newer company, truly makes quality products. Very comfortable grip and lightweight. I recommend this chainsaw for cutting wood up to 8-inches in diameter. It’s a fairly powerful small chainsaw that satisfy many homeowners. I must add, when you buy a GreenWorks chainsaw you get a very generous 4 year warranty, which is quite rare with power tools. As far as peace of mind goes, even if this small chainsaw breaks down, at least it’s covered by the warranty. View or download the MANUAL for the GreenWorks 20262 (20202). Our next small chainsaw is very similar to the previous 40V GreenWorks. It has the same design and overall form but it has less power and a smaller bar and chain. The GreenWorks 20362 G-24 is powered by a 24V motor and has a 10″ bar and chainsaw. Think of this model as the smaller, lighter and less powerful version of the GreenWorks 20292 40V. Includes: G24 10 inch 24V Chainsaw, 2Ah Battery, Charger, 10″ Bar and Chain, Scabbard, Owner’s Manual. View or download the MANUAL for the GreenWorks 20362 G-24 (Model: 2000102). 10″ bar & chain. Great for trimming branches, pruning and other cleanup tasks. Tool-free chain tensioner. No tool required to adjust the chain. Automatic oiling system keeps the chain lubricated. Clear view of the oil level. 24V Lithium-ion battery. Fade-free power. No memory effects. Wrap-around handle makes it easy to cut at various angles. Reduced kickback chain makes it safer to use. The GreenWorks 20362 G-24 is another great small chainsaw well-suited for those small jobs around the yard. This is ultra-compact with its 10″ bar and chain. Perfect for pruning, limbing and felling very small trees — up to 8-inches. Although, since this is only a 24V chainsaw it will cut most efficiently with wood under 6-inches. The battery charger can take up to 3 hours to fully charge the battery and expect to get up to 50 cuts per charge. That number is from GreenWorks and it’s based on cutting wood 4″ in diameter. If you’re a new chainsaw owner you need to know that the life of a battery is directly determined by how you use the saw. So, if you push this chainsaw and cut larger pieces of wood from 6″ to 8″ then expect the battery to last under 30 minutes. On the other hand, if you cut wood under 4″ in diameter then you will probably get about an hour of usage from this chainsaw on a single charge. That’s why it’s important to buy the right size chainsaw for your needs. I would never recommend this chainsaw for homeowners who need to cut large branches and firewood on a regular basis. If you have a need for more demanding cutting jobs (8″ to 10″) and you need a small chainsaw then I would highly recommend the Makita UC3551A or the Black & Decker LCS1240. Taller than a traditional chainsaw. The GreenWorks 20362 G-24 is a very good small chainsaw that’s both lightweight and easy to use. Perfect for homeowners young and old who just need a chainsaw to use for light-duty yard clean-up. The overall design makes it easy to hold and work with without causing fatigue. Yes, batteries are expensive but it’s nice to have a second battery when you’re working. Things always take longer than you expect. If you need a powerful small chainsaw and you’re comfortable with performing the necessary maintenance then a gas chainsaw might be a good option for your. The advantages of a gas chainsaw is the power and cutting speed they inherently have. Although, some electric and battery chainsaws rival the power of a small gas chainsaw, such as the Makita UC3551A and the GreenWorks 80V (equivalent to a 45cc gas chainsaw). I’m assuming that you’re looking for a small chainsaw because you don’t need to fell 30″ trees on a regular basis. My personal recommendation to you, and most people who only have light to medium-duty cutting needs is to stick to either an electric or battery chainsaw. They’re easy to use, relatively quiet, no fumes, very little maintenance and are generally much lighter and easier to hold. Next, let’s look at the two small gas chainsaws on our list. Heavy & challenging to start. For the money, the Poulan 3314 is a very good small chainsaw. It’s rare to find an inexpensive gas chainsaw and the 3314 is around the $100 mark. Poulan is a consumer brand owned by Husqvarna. Poulan Pro chainsaws are of higher quality than the Poulan brand. For example, the Poulan Pro PP5020AV is superior in quality to the Poulan 3314. 14-inch steel bar & chain. 33cc engine with gear-driven automatic oiling system. Capable of cutting wood up to 28-inches in diameter. Super clean air filter system. Manual primer bulb for starting. Non-CARB Compliant. Not for sale in California. View or download the MANUAL for the Poulan P3314. A cheap gas chainsaw suited for people who like to tinker. Powered by a small yet capable 33cc 2-cycle gas engine, this 14″ gas chainsaw is a basic model with a few features, such as: automatic chain oiler, patented super clean air filter system, and a primer bulb for quick. When you buy a cheap chainsaw such as this you’re not going to get all the bells and whistles as you’d get for a more expensive chainsaw. Unfortunately this small chainsaw doesn’t have anti-vibration technology, which I highly recommend when buying a gas chainsaw. Gas chainsaws give off excessive vibration which is bad for your health. If you buy this chainsaw then you must buy anti-vibration gloves to protect yourself. Read our buying guide on anti-vibration gloves. We explain what happens if you’re exposed to excessive vibration. This chainsaw arrives fully assembled and is protected by a 1-year warranty. This is a heavy chainsaw at 16 lbs, so if you’re not strong and fit then don’t buy the Poulan P3314. It’s not lightweight and you will get tired using it, unless you’re built like a lumberjack. For the average homeowner I recommend buying an electric or battery powered small chainsaw because they are much easier to use and maintain. This Poulan small chainsaw is suitable for people who are already comfortable with a chainsaw and know what they’re doing. I know many people love to tinker with their power tools so if you’re one of those types then this may be a good choice for you. Starting the Poulan P3314 can be challenging and this is the main complaint of customers who bought this chainsaw. Now, I suspect that many homeowners don’t read their manual thoroughly so I’ve included the starting procedure here. I wish Apple (the tech company) designed a chainsaw. They would never allow such a convoluted starting process. Either way, at times you may get frustrated with starting this chainsaw and it may occasionally stall on you. Customer satisfaction is generally high with this chainsaw but the top complaints are: Starting problems and that it’s a heavy chainsaw. TIP: Make sure the chain brake is as close to the handle as possible when starting. This important, otherwise the chainsaw won’t start. Mix 3.2 ounces of Poulan 2-cycle air cooled engine oil to one gallon of fresh unleaded gasoline to obtain the recommended 40:1 fuel to oil ratio. Shake the mixture for 10-15 seconds after the oil is added to the gasoline to make sure the oil and gasoline combine together. Mix it correctly to ensure your chainsaw runs & starts properly. You can read more about chainsaw engine oil and fuel on the Poulan site. Engineered for cutting high off the ground. The Husqvarna T435 is a top handle chainsaw which means it’s designed for homeowners, or arborists, who need to consistently cut from an elevated position. This small chainsaw by Husqvarna is not for ground cutting. The top handle makes it easy to use the chainsaw from a wide-range of awkward positions. Again, if you’re a homeowner looking for a chainsaw for pruning, limbing, firewood and felling trees then don’t buy this Husqvarna T435. On the other hand, if you’ll be pruning trees and your feet will be off the ground then this is an excellent lightweight chainsaw weighing only 6.5 lbs (without the bar & chain). It’s very light and extremely efficient, powered by the Husqvarna X-Torq 35.2cc engine. The T435 is also made in a 16″ rear handle version which is appropriately named the Husqvarna 435. It’s essentially the same chainsaw except it’s a traditional rear handle design. View or download the MANUAL for the Husqvarna T435 top handle chainsaw. X-Torq 35.2cc engine: Improved fuel consumption and lower exhaust emission. Adjustable oil pump: Enables you to control oil flow depending on usage and weather conditions. Anti-Vibration: Designed to reduce vibration levels. Quick-release air filter cover: Fast & easy access to the air filter and spark plug. Side chain tensioner: No tools required to adjust the chain. Anti-Vibration: Safer with reduced vibration levels. Chain brake window: Enables you to see to the guide bar tip. Rope attachment: A solid hole for attaching a rope to hoist up a tree. Air Purge: Removes air from carburetor and fuel system for easier starting. Inertia activated chain brake: A protective measure if kickback occurs. The difference between an average saw and a professional small chainsaw such as this Husqvarna T435 is the fact that even though it’s a gas chainsaw it’s not heavy like the Poulan P3314. Husqvarna designs their chainsaws with components that are optimized and streamlined to work well together as part of one system. Cheaper chainsaws aren’t refined and optimized. This is why one chainsaw is more expensive than the other. It comes down to the quality of engineering. When it comes to chainsaws, you get what you pay for and considering how dangerous these tools can be I always recommend buying the best quality you can afford. After all, it’s your life and safety it risk. Please wear proper safety gear at all times. Always wear the proper safety gear as well, such as: Chainsaw Chaps, Head Protection and Anti-Vibration Gloves. This small chainsaw is very well-balanced which makes it very easy to work with when you’re cutting from an elevated position. Light enough to cut with one hand for those rare occasions. Don’t make a habit of it. If you want more information read our in-depth review of the Husqvarna T-435 in our comprehensive article on Top Handle Chainsaws. I know for a fact that many homeowners are fearful of using a chainsaw, and to be honest, some people just shouldn’t use a chainsaw. If you’re not comfortable with power tools then maybe it’s best to ask someone who is to help you with your yard needs. Thankfully, there are some excellent alternatives to a traditional chainsaw that may surprise you. The rest of this article will be focused on these fantastic alternatives to a small chainsaw. And honestly, if you’re uncomfortable with using a chainsaw I strongly recommend that you either get someone to teach you the safe way to use a chainsaw or consider one of these options. Consequently, it’s okay to hire a professional to do your cutting for you as well. You have many options. The important thing is to find the right tool for your needs, as well as choosing a tool that you’re comfortable with. My job is to give you the information you need so you can make a decision that you’ll be happy with. Okay, let’s look at a few more options. The JawSaw is the ultimate tool for safe cutting. The WORX JawSaw is truly a remarkable machine that fills the gap in the market for people who don’t want to use a chainsaw. As you would imagine, this chainsaw alternative is extremely popular with homeowners because it’s so easy to use, but more importantly it’s very safe to use. Everything is automated and the risk of getting injured is extremely low. You’d have to fall on it to injure yourself, it’s that safe. Before I get into the details I want you to watch this video of the WORX JawSaw WG307. Decide for yourself. No amount of words I write can communicate as much as this video can. This section is focused on the electric JawSaw, but there’s also a 20V battery model (WG320) which I’ll discuss later. Fully-enclosed bar and chain is designed for optimal safety. Blade housing allows you to work safely. Stability: Steel teeth grip the wood tightly while cutting. Automatic chain lubrication & oil level indicator. View or download the MANUAL for the Electric JawSaw. View or download the QUICK START GUIDE. The JawSaw has been designed and engineered for the sole purpose of protecting you, the operator, while still allowing you to cut branches under 4-inches. Yes, there is a limit to size of branches it cuts but for the needs of the average homeowner this will meet their requirements. Unless you need to fell trees or cut firewood this WORX JawSaw should satisfy the majority of your yard cutting needs. If you don’t like chainsaws then this is the tool for you. The WORX JawSaw WG307 is the type of tool that will make you wonder why more companies don’t streamline their tools and make them easier to use. WORX is a relatively new company but they’ve been growing quickly and winning over consumers with their innovative products and excellent marketing campaigns. It’s nice to see a company educate consumers about their products as WORX does. I’ve covered many WORX products such as the Aerocart Wheelbarrow, AIR Leaf Blower, GT2 Trimmer/Edger, WG303.1 electric chainsaw and several other yard tools. This power tool seems to be quite popular with women and elderly people. Let’s be honest, not everyone wants to tinker with their tools. This small chainsaw alternative is perfect for anyone who appreciates simplicity in their tools, and for those who don’t like to fuss or perform complicated maintenance. I know there are a lot of you out there — this small cutting saw was made for you. Oil Tank Capacity: 1 oz. A back-up chain is always good to have nearby. If you need the functionality of a pole saw then you can buy the extension pole for the JawSaw. Although, it’s cheaper if you buy the Combo JawSaw WG308, which also includes the extension pole. Extends up to 12 feet for pruning up high. Compatible with models WG307 and WG308. Buying the combo package will save you some money. Combo package JawSaw: Model WG308. When using the JawSaw with the extension pole you’ll need to make sure you can handle it physically. This is not for the weak. The JawSaw weighs around 8.1 lbs, and the extension pole weighs around 5 lbs. If you’re cutting at a relatively vertical angle then it’s not too difficult to handle but it becomes awkward to use if you position the JawSaw horizontally. Know your limits. If you’re not physically strong the extension pole might prove too challenging for you to handle. Don’t worry, the last small chainsaw in this article is a lightweight (and cheap) pole saw that doubles as a small chainsaw — the Remington Ranger. Either way, the JawSaw extension pole is a great option for those difficult to reach branches, allowing you to safely cut up to 12 feet from the ground. Includes: WORX WG320 JawSaw, WA3520 battery, WA3732 charger, 50022097 wrench, 3.4-ounce bottle of chain oil, 50022096 bottle. Powerful 20V Max Lithium battery. Lightweight, compact and much safer than a chainsaw. Automatic chain tension system. The chain is always optimal. Scissor cutting motion reduces chance of dangerous kickback. Blade housing keeps the chain enclosed at all times. This is a highly versatile tool. Who needs a chainsaw. The 20V WORX JawSaw is identical in design to the electric model except for the fact that it’s powered by a battery. The advantage of this model is the fact that you don’t have to manage an extension cord. Other than that, the features are all the same. The beauty of battery power is that you have complete freedom of movement as you work and you don’t have to be near an electrical outlet. A good investment if you want to work longer. Whether you need to replace your old JawSaw battery or want peace of mind to ensure you have enough battery power to finish your yard projects. Either way, this is the 20V battery for your JawSaw WG320. Powerful: the high-density battery with near double the capacity. Reliable: Will hold its charge when not in use. Peace of mind when you need more juice. If you can use scissors you can use the Alligator Lopper. The Black & Decker Alligator Lopper is like a giant pair of scissors. It comes in a 20V battery and electric model as well. 20V MAX* Lithium battery provides up to 150 cuts (1.5″ diameter) per charge. Safe to Use: Dual-hand switches must be engaged before cutting. Prevents accidental starting. Unique clamping jaws grab and cut branches and brush in one smooth motion. Made from heavy-duty materials. Can cut branches and logs up to 4-inches thick. Scissor-action allows you to cut branches in a natural motion. Compatible with the Black & Decker 20V* MAX* System. View or download the MANUAL for the Alligator Lopper LLP120. The Alligator Lopper is another excellent chainsaw alternative. Essentially, this tool works like a pair of scissors. Open the Alligator Lopper with the handles and then the housing teeth grab onto the branch and the inner bar and chain cuts the wood. The LLP120 is a 20V battery-powered tool which is lightweight at only 6.8 lbs, making it easy to carry out your cutting duties around the yard. The Alligator Lopper cuts like a small chainsaw. It’s simple to use and much safer to operate as well. The oiling system is messy and a chore to do. Personally, I recommend the WORX JawSaw over this Black & Decker model because I feel the JawSaw has a better design. The WORX JawSaw automates everything for you, such as chain oiling and maintaining the chain tension. Overall, the JawSaw is easier to use and more effective. The Alligator Lopper requires that you oil the chain manually and it’s a messy process. Unfortunately, they made this task too much of a chore for homeowners. The Alligator Lopper has a rugged metal guards that covers the cutting ‘Jaw.’ This guard protects you from the cutting chain as it immediately covers the blade when your cut is complete. The main reason you would buy a JawSaw over an Alligator Lopper over a small chainsaw is because of the additional safety protection that these tools offer you. If you value safety and simplicity then either the WORX JawSaw or the Alligator Lopper will satisfy your needs. With the electric model you’ll have to wrestle with the extension cord. The Black & Decker LP1000 is the exact same tool as the battery version, the only difference being that you’ll need an extension cord instead of a battery. View or download the MANUAL for the Alligator LP1000. 4.5 amp motor for light-duty cutting. Capable of cutting wood up to 4″ in diameter. Combination chainsaw / pole saw. Great value. The Remington Ranger is the final option on my list for best small chainsaw. Yes, it’s a pole saw but it’s also designed for you to easily detach the 10″ chainsaw from the pole. Simple flip & lock clamps allow you to quickly disconnect the pole from the saw enabling you to cut on the ground whenever you need to. It’s only an 8 Amp chainsaw so don’t expect to do any heavy cutting but it’s perfect for pruning, trimming and felling trees as long as the wood is under 6″ in diameter. 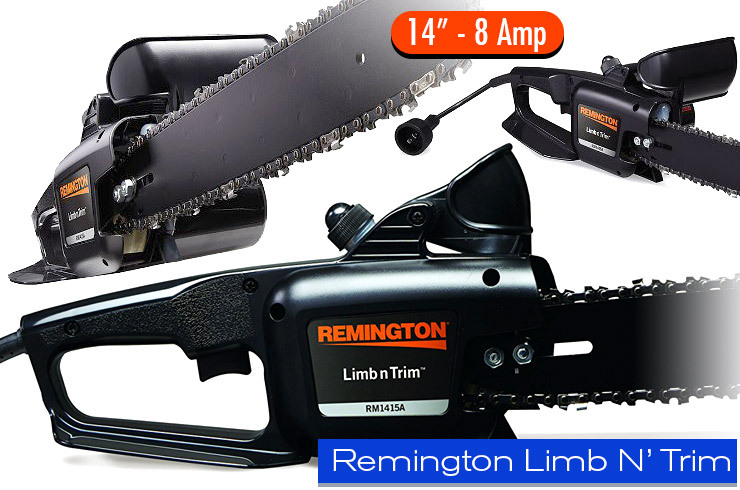 This is basically the Remington RM1415A Limb N’ Trim small chainsaw that I covered earlier in this article except this version has a 10″ bar and chain instead of a 14-inch. And, you also get the extendable poles for pruning trees up to 15 feet high. This is a very popular pole saw / chainsaw combination with a very high rating overall. It’s not the most durable chainsaw you can buy but for under $100 you get a lot for your money and it’s well-suited for homeowners who need a chainsaw once-in-a-while. Don’t plan to cut down the Amazon forest with this tool and you’ll be fine. Curb your expectations, but for occasional usage, this is an excellent choice with a lot functionality for your yard cutting projects. Remington pole saw : Excellent value for under $100. TIP: This is a drip type oiling system and the oil will leak out if you leave oil in the chainsaw when not in use. When you plan on storing it for awhile I recommend emptying the oil. Or, make sure you account for the leaking oil when you store it. In other words, put something under the saw to collect the oil. Don’t store it on your tuxedo or wedding dress. Included: 10″ 8-amp detachable electric chainsaw, extendable aluminum pole, owner’s manual. Small yet capable 10″ electric chainsaw. This pole saw might be heavy for some people so please be aware of your limitations before projecting this in the air. The total weight of the chainsaw and the extension pole is about 11 lbs. Make sure you’re physically fit if you plan on using this Remington chainsaw and always practice safety when working with any chainsaw. View or download the MANUAL for the Remington RM1025SPS Ranger. 2-In-1 Detachable Pole Saw (No Tools Required). 10″ Oregon Bar & Chain With 8-Amp Electric Motor. Flip & lock clamps are quick and easy to use. Stable and strong; keeps the chainsaw secure. Aluminum poles are adjustable and extend up to 15 feet. Non-slip grip keeps this pole saw firmly in your control. Locking trigger prevents accidental starting. What’s the Best Small Chainsaw? Well, I’ve given you a lot of options to consider in this article. I understand that everyone has different criteria when it comes to purchasing a chainsaw. But I made a conscious effort to include something here for everyone, even if you’re on a tight budget. And, for the record, there is no “best chainsaw,” or “best” anything. The best choice is always personal and has to meet your own needs. My job here at Chainsaw Journal is to present you with great products that will be worth your money. I aim to only give you excellent product options because I see no point in wasting time presenting poorly made products. Also, no matter what you buy, there will always be products that are faulty straight from the manufacturer. Unfortunately, customers occasionally receive products that, for a myriad of reasons, have issues right out of the box. That doesn’t mean it’s a bad product, it just means they were unlucky. When reading reviews from customers online it’s best to determine if a product is actually badly designed or they received a lemon. There’s a big difference between those scenarios. In other words, don’t believe everything you read online, including what I write. Look at the opinion of the majority of customers over time in order to determine if you should spend your money on a particular product. That’s true for chainsaws, and everything else you buy. I hope you found this article useful. If you have any questions or comments you can reach me through our CONTACT page. I love hearing from our readers. Oregon 54-026. Popular among chainsaw owners. And, for a bigger size this Makita bar & chain oil is a good value.